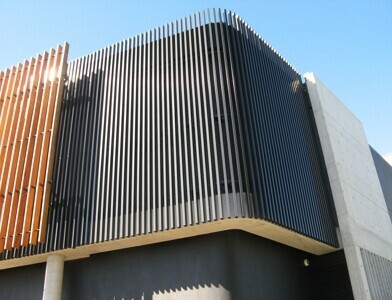 SUPAWOOD’S ALUCLICK aluminium beams feature extensively on the exteriors and SUPACOUSTIC and SUPALINE decorative panels are used throughoutmost of the interior of the high profile redevelopment of the Royal Randwick Racecourse spectator precinct. This multi-million dollar redevelopment has turned this iconic Sydney landmark into a world-class sporting, hospitality and conference facility. The redevelopment includes a new Grandstand and Theatre of the Horse buildings which have been designed by Australia’s pre-eminent architectural practices Fitzpatrick + Partners (base design) and Woods Bagot (interior fit out). The fit-out contractors favoured SUPAWOOD because of their proven track record in meeting tight lead times while maintaining the highest standards in supplying consistent quality products. The entry side of this building features ALUCLICK beams along its expanse underwide eaves which creates a dramatic linear effect. The beams also line the ceiling above the multilevel escalator access. At the main entrance level the beams then flow through over the entry court and into the main reception area. The ALUCLICK beams used are in Dulux Domino custom finish to match the windows and other powder coated features. In total over 7 kilometres of ALUCLICK beams were supplied. SUPALINE bespoke panels in custom sable, clear, white and black timber veneered finishes are used extensively throughout the interior corridors of the main building. Much of this panelling has been vertically grooved to create a tongue and groove texture. This choice of panelling throughout these high traffic areas ensures longevity, excellent durability and low maintenance. Throughout the interior of this building more than 2500m2 of panels were supplied including over 120 pre-curved wall panels. Other areas where SUPALINE has been used are on the walls in the central ballroom and some of the bars, lounges and restaurants areas. Further use of both SUPALINE and SUPACOUSTIC panels can also be found in many of the corporate boxes. The Owners Pavilion at the south end of The Theatre of the Horse features ALUCLICK lightweight aluminium beams which have been used vertically on the façade to create curved corners on the building. By using ALUCLICK beams on this smaller building’s exterior, coordination between the designs of the 2 buildings has been achieved. The exterior contemporary design of the pavilion building flows through into the main lounge area. Here the ceiling has been lined with floating custom SUPACOUSTIC perforated triangular panels in SUPACOLOUR high gloss white set against a black surface above. The lighting and other utilities have been placed between the panels. The manner in which the panels have been positioned mean that ease of access into the ceiling cavity above has been maintained. This ceiling panel design has achieved great dimension within the space. The surface finish helps to illuminate the area by reflecting light while the panels’ acoustic properties eliminate noise reverberation from the high ceiling. This project highlights the versatility of the SUPAWOOD product range, the scope to which the products can be used in a large project and SUPAWOOD’s ability to deliver consistent quality to stringent lead times. Exterior and main entry ceiling beams and corner features on Owners' Pavilion - ALUCLICK in Dulux Domino. Main building interior: SUPALINE sable, clear, white and black timber veneered finishes with some paneling custome grooved. Owners' Pavilion lounge ceiling - SUPACOUSTIC perforated panels in SUPACOLOUR High Gloss White. Architect: Fitzpatrick+Partners (base building) and Woods Bagot (fitout, interiors).